Are you a homeowner who has been paying on a mortgage for some time now? This calculator will help you determine the remaining balance on your mortgage. In the fields provided, enter the original mortgage amount, the annual interest rate, and the original repayment term in years. Those 3 numbers will be used to automatically calculate the principal & interest portion of the associated mortgage loan. If you have paid a different amount, you can overwrite the monthly payment amount to whatever you paid to base your calculation on the alternate actual payments you made. Then choose one of the three options related to how many payments you have made so far or have remaining. Click on “Calculate Balance” and you’ll see how many payments you’ve made and the remaining balance on your mortgage. This calculator can also be used to estimate what you will owe in the future on your loan. Calculations are done automatically each time a variable changes, so you can quickly see how much your loan balance will change over time if you make different payment amounts. In the excitement of buying a home, many people think more about how much house that they can afford with their monthly budget instead of how long it takes to pay off a 30-year mortgage. The good news is that a 30-year mortgage does not need to last for the full 30 years. It is possible to pay down a mortgage painlessly in much less time. It does take forethought, dedication, and a concrete plan to see results, but simple changes now can take years off a mortgage. Here are five ways that you can pay down your mortgage principal faster. Contrary to what seems logical, refinancing a 30-year loan into a 15-year loan will not double your payments. Since payments are based on principal, interest, taxes, and insurance, often called PITI, the only variables in refinancing are the interest rates and added principal payment for the shorter-term loan. Refinancing to a 15-year loan will increase your payment, but oftentimes the increase is not a significant amount. This is especially true if you purchased your home pre-recession, when interest rates were around 6 percent. Today, 15-year mortgage payments are comparable to 30-year mortgage payments at the higher interest rates. A 30-year mortgage, with a principal amount borrowed of $100,000 at a rate of 6 percent for 360 months, has a monthly payment of $599.55. Try the mortgage calculator to find out how much you can expect to pay on a 15-year mortgage compared to a current 30-year mortgage. In the example above, an additional $100 per month took 15 years off a 30-year mortgage. That is 180 months of an additional $599.55 in your pocket. Since taxes and insurance are factors in mortgages, challenging your tax assessment and shopping for cheaper homeowners insurance can save additional dollars on your PITI. There are pros and cons to choosing to make extra principal payments instead of refinancing. Overall, making additional principal payments can be a win-win if you are disciplined enough to make the additional payments on a regular basis. If you can pay an extra $100 per month towards principal on a $100,000, 30-year mortgage, the average time shaved from the loan is nine years. Bi-weekly payments will shave a few years from a 30-year mortgage and is relatively painless. If your monthly payment is $1,000 per month, and you pay $500 every two weeks instead of $1,000 per month, you make one extra house payment per year without missing the extra money. The savings comes by making 26 payments of $500 instead of 12 payments of $1,000. On a 30-year mortgage, you can expect to eliminate an average of six years from your loan. It may not seem like a lot of years, but when you put $72,000 back in your pocket during the final six years that you would have paid a mortgage, you may think otherwise. Bi-weekly payment plans can usually be set up through your bank or mortgage company. Most do offer a bi-weekly plan free of charge. You can also ask your mortgage company to set aside the extra payments until the end of the year so that they may be applied to principal, paying down the mortgage even quicker. This is an excellent solution if you own a larger home that has a separate entrance that can easily be converted to a small apartment. By converting a basement, attic over a garage, or second floor into a small apartment, you are able to rent to a tenant and use the added income towards your mortgage. Renting a portion of your real property can also give you significant tax breaks. Use the tax savings to pay down more principal on your mortgage. Homeowners in college towns find that renting a room to a college student works well. This is a great solution since it requires no renovation. The downside is that renting a room means that the tenant will share common space, so written house rules about common areas are imperative. 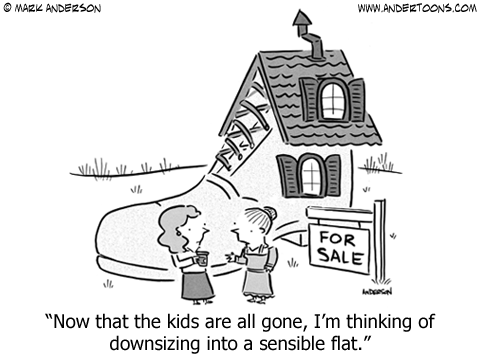 If you have been in your home for a while or property values in your area are rising, downsizing is the best way to pay down your mortgage fast. Do you need all the space in your current house? If the answer is no, then why not move to a smaller home? You can use the profit from the sale of your current home towards the new home. There are tax savings if you make a profit and reinvest the profit into another property in which you will live. The significant down-payment, and less expensive home, makes short-term mortgages a reality. Depending on how much you need to borrow, you may even be able to consider a 10-year mortgage. You can own your home free and clear in about as much time as some people pay on their auto loans. The bottom line is that 30 years to pay for a mortgage is a very long time, and it is not necessary. If taking advantage of one of these ways to shave years from your mortgage will not work for you now, there is a good chance that one will work in the future. For now, if you cannot take more permanent action, pay a little extra principal when you can. Even an extra $10 a month can make a difference in the long run, especially with a new 30-year mortgage.